I get no greater joy in edtech than when I can find new ways to app-smash and combine add-ons to solve problems and create new workflows. It’s the super geek in me that just won’t go away. Just today, I presented a hands-on session at a conference called Make Feedback & Easier with Google Forms and Sheets Add-ons, focusing on automating and improving communication. These are quickly becoming my favorite types of professional development to facilitate. And when I’m stressed or overwhelmed, I feel a calming power from the complexity of a lengthy Google Sheet function that I can’t explain. If you’re reading this blog, this probably isn’t too much of a surprise as I write about forms, sheets, and add-ons constantly. That’s why I was thrilled when New Vision Cloud Lab asked me to be a part of their Ignite Throwdown at Google’s NYC headquarters. The event celebrated the release of autoCrat 3.0, which you can learn more about in this episode of the Schoencast. The ignite talk was my first shot at this kind of event and audience size, and I was excited. An ignite talk is five minutes long with 20 slides that automatically transition every 15-seconds. This meant that I needed to be well prepared and memorized to make sure that my words matched my visuals, and New Visions asked us to keep to a schedule in for the script, slides, and rehearsal. 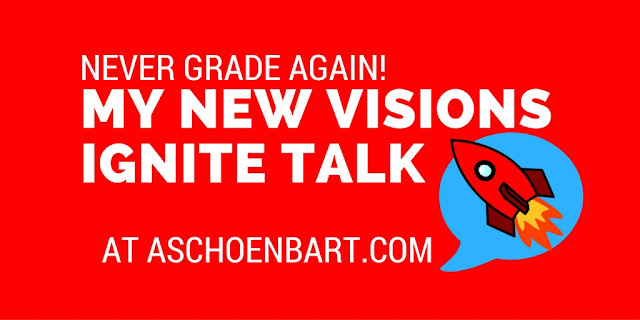 I was given freedom to design my talk, with the goal of featuring some of New Vision’s fantastic products along the way. One of the big challenges was timing, so I tried to figure out how many words I could plan per slide. 42 was the magic number for me, with some scripts being shorter as needed. I tried to build in time for pauses, effect, and reactions, too, and this was hard. I worked and reworked the script, practiced by myself and for others, recited the script in the car for days, and worked really hard for the big day. The focus of my talk was using autoCrat with Google Forms to help automate communication and grading. But one of the most important pieces of advice I’ve ever received is to not focus the heart of a speech on tools or even technology. Instead, I wanted to focus on a message and on students. I developed this tagline to summarize the story I wanted to tell: Learn how New Visions add-ons made feedback & grading better, easier, and automatic so teachers had more time for what matters most: students. For me, telling a story was essential. I wanted my talk to have heart, to showcase students, and to make an impact. I wanted to use the technology and add-ons as tools to help do this, not as the story. And this is advice I want to continue to apply in my work as a speaker, where I hope to grow and improve. Preparing for five minutes was a challenge and really made me think about speakers who deliver powerful memorized keynotes and similar sessions--I’m impressed! In the end, I veered from my script a little bit. I said things that I didn’t exactly plan. But I think the whole was better for it. I’m proud of my talk, the work it represents, and the students it’s all impacted. The video of the talk was just released, which is why I’m writing about it now. Below, find an embed of the video from YouTube plus a copy of the slides if you want a closer look. I’m proud to have participated in the event with so many other great speakers and can’t wait for next time.